R-239 (hull number 953) is a Project 12411 missile boat designed for destruction of enemy warships, transport and assult vessels, terrorist groups in the sea and in the bases; protection of ships and vessels from surface and air attacks. Missile boat R-239 (serial number 214) was laid down at Srednenevsky Shipyard on April 30, 1991; put afloat on August 23, 1991 and commissioned into Black Sea Fleet on March 23, 1992. The boat serves in the 41-st Missile Boat Brigade based in the Karantinnaya Bay (Sevastopol). In 2004, it was supposed to lay up the boat for interim overhaul, and not only replace main propulsion plants but to plant the newest gun/missile antiaircraft system Palash instead of two stern gun mounts AK-630. 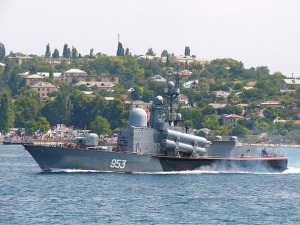 However, it was another Black Sea Fleet missile boat to receive that system first – R-60 – and only in 2005. Through her service in the Russian Navy right up to the present days, crews of the boat have carried out 10 missile launches, 56 gun firing drills, and over 60 times held the fleet and air defense patrols.